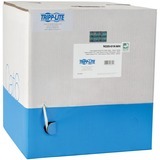 The N230-100-STR contains 100 unshielded RJ45 modular plugs for round stranded UTP conductor 4-pair Cat6 cable. 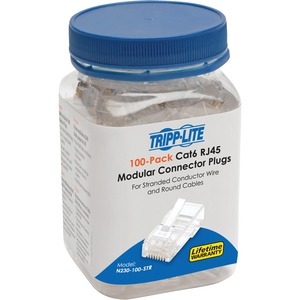 Recommended for creating your own custom-length Cat6 cable runs, these clear connectors come in a shatterproof plastic jar that's easy to pack in your toolbox and carry to your next installation. 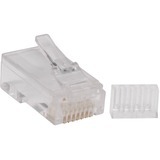 Ideal for data and voice applications, these reliable RJ45 connectors are designed to terminate round Cat6 cable, such as Tripp Lite's N220-Series patch cabling. Their 15-micron gold-plated contacts ensure reliable signal transmission throughout the cable run, and their staggered nose pattern reduces near-end crosstalk. They are compatible with most RJ45 crimping tools (with AMP an exception).